She informs that she is a double graduate- trained as a business management student (BBA, major - marketing), post that trained as an artist (BFA-Sculpture) from College of Art, Delhi. But then quite 'hatkey' from her education, she owns and runs what we all know as VEGAN FIRST which is not just a Community at SHEROES but she calls it her mission in life! So let’s dig deeper into the life of the 33-year-old Palak Mehta who is based at Pune, Maharashtra in India. And unfold a yummy, inspiring story! "Mahima you might laugh but I exhibited as a solo artist for a few years. Even taught fine arts to a variety of age groups in Delhi and Pune - from pre-primary in Delhi to senior fine art teacher for the ICSE board students at a reputed school in Pune. Handled global social media campaigns for charity organizations for over 8 years. Volunteered at shelter homes. All before VEGAN FIRST happened to me,” asserts a very upbeat Palak, who doesn't mince words in adding that Veganism happened to her out of experiments and not as an initial choice. "Yes, I thought I knew of the benefits of a plant-based diet, and I would experiment with it often, I was clueless about the cruelty behind our food and lifestyle choices. My spiritual Master Mohanji was the one who started talking about veganism and animal rights. After coming back from a Kailash Yatra about 6 years ago, I decided to go vegan," recalls Palak who adds that it was pretty challenging. "You know there was no handy restaurant list that I could find online; information on Indian vegan recipes were scattered across social media. I found a lot of products on socials which were categorized as vegan but turned out to be only cruelty-free. Turning vegan became very challenging. I had just quit my job as a school teacher at the time and was inspired to create a platform for Indian vegans- Creating awareness, giving the right recommendations of Indian vegan products, recipes and services became key. It was a tough call in the beginning because I had no back-up, was living on my own and had running expenses, but nothing can stop an idea whose time has come right? Started scribbling on a piece of paper, got a really small investment round and roughed it out- creating value at every stage got us the traction and things grew on from there. Finding the right vegan people, even the right information for the industry was challenging in the beginning, We had to vet each restaurant, filter out the vegan ones and list them down on Vegan First, but that's an early movers challenge and advantage that we were more than happy to take on. Today after 2 years of its launch, Vegan First is the largest Indian vegan platform and solution space for anyone who wants to lead a conscious, kinder and healthier lifestyle," smiles a jubilant Palak who adds that she has gone too much into details, only for the benefit of those who wish to follow in her footsteps. "Over 150 million animals are killed for food around the world every day, we're already facing a species extinction - we have to be conscious of our choices and before it’s too late. The commodification of animals has to stop through intelligent disruptions," Palak asserts and her venture is just a small yet strong one, in this arena. And in just two years VEGAN FIRST has come a long way. It has even been featured in the reputed Forbes India magazine amongst many other publications. And Palak informs that VEGAN FIRST has also been a key media partner for most of the vegan festivals in the country. Palak tells me how she was introduced to SHEROES and how VEGAN FIRST got onto a new flight! And but obviously, I ask her, what has been the highest personal point in this journey, that hasn't been easy. She smiles and states," Vegans are often mocked and outcast. Some acquaintances and friends of mine made fun of me as well- later the same people came to me asking for substitutes because their near and dear ones were diagnosed with lactose intolerance. And some wanted to switch since they actually had a change of heart for using products that were not a result of cruelty to animals." No wonder some famous people like Ellen DeGeneres, Kangana Ranaut, Sonam Kapoor Ahuja and many more! And science lists the following as major health benefits that Vegan people have over others. A Vegan Diet Is Richer in Certain Nutrients, which are otherwise lost due to consumption of animal-based products. It Appears to Lower Blood Sugar Levels and Improves Kidney Function. A Vegan diet is also Linked to a Lower Risk of Heart Disease. VEGAN FIRST is promoting these and much more. So where is VEGAN FIRST headed next Palak? "Mahima, I am pretty excited about the Vegan India Conference with the WVO (World Vegan Organisation) India's first international vegan conference which will be held in July 2019. And also we will also be releasing the first ever book on the rise of Indian veganism pretty soon!" She says there are a multi-million health benefits of going Vegan. "A vegan diet is cholesterol free, there is high energy in living foods, which we don't need. For instance, a cow's milk is meant for a calf, not a human child since man is the only mammal drinking milk from another species. And as a result, India is one of the largest exporters of beef- because of the dairy industry," Palak lays some startling facts as well as shows me the umpteen Vegan recipes that her website has which can be used and practised by all, for free. "Well, all I can say is be confident, unapologetic yet humble and be laser-focused on creating a change that is healthy for you and your family. Change the norm- if you don't who will?" So that was Palak Mehta, up close and enlightening in our #MeetTheSheroes Series. 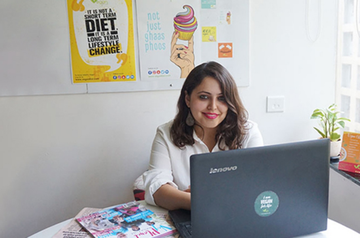 You can follow Palak on SHEROES and join the VEGAN FIRST COMMUNITY at SHEROES. Don't forget to leave your queries for Palak in the comments below, she will personally answer it all. Head to the Vegan First Community!